Paul MacCready is one of those very special people about whose life it is very difficult to write a concise description. Even listing his awards only would take far more space than available here. Describing his soaring accomplishments and contributions alone would fill a large book. We encourage you to read more about this remarkable man and his amazing creativity. Words that especially express his life's work are - Do more with less. If Paul had done only one thing - become the first American to win a World Soaring Competition when not even needing to fly the last day -- he would easily find a place in the Soaring Hall of Fame. This reporter first met Paul at the 1953 National Championships in Elmira which he won (for the third time). He graciously offered a ride part way home. If you don't think the conversation during that drive was one of the most memorable of my life, think again! After we had both individually moved to California, I prepared a booklet describing the soaring community in Southern California - mainly for the purpose of my learning about the area and the people. Paul sent me a congratulatory card (which I still have) for the effort. 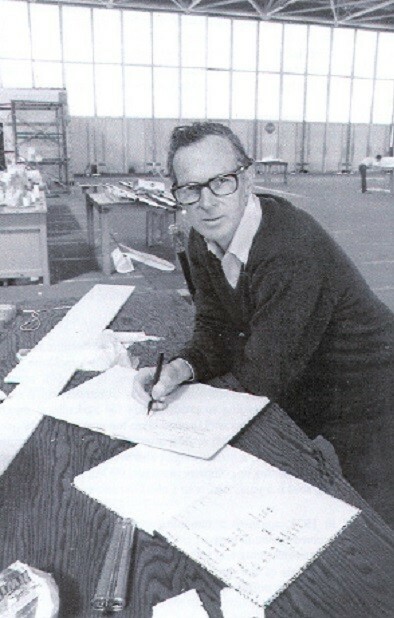 Paul B. MacCready was born in 1925 in New Haven, Connecticut. His early interest in flying came from studying bugs, butterflies and moths and grew to building model airplanes and gliders. He served in the U.S. Navy V5 pilot flight training program and graduated from Yale University in 1947 with a degree in physics. Later he earned his PhD from Cal Tech and extended his interests to meteorology. He formed his first company, Meteorology Research Inc., in 1951. 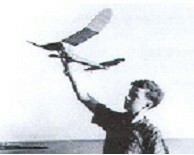 Among his many fascinating projects with which he was involved was a wing-flapping, computer-brained, radio-controlled and astonishingly realistic replica of the prehistoric pterodactyl which was photographed flying over Death Valley for the Smithsonian's IMAX film On the Wing. Another project is well-known to soaring pilots as an easy in-flight indication of the optimal speed to fly - the MacCready Ring. 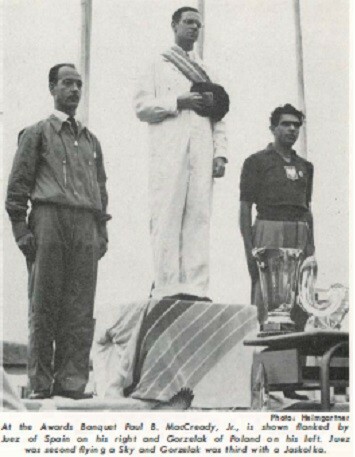 Paul on the podium at the World Contest Award Ceremony, St. Yan, France, 1956. Paul achieves his dream at St. Yan, France and is World Champion - the first American. Paul at one of his desks. The FAI awarded Paul the Lilienthal Medal in 1956, the Tissandier Diploma in 1977, the FAI Challenge Cup in 1956 (first American) and the OSTIV Plaque/Klemperer Award in 1981. The SSA awarded him the Eaton Trophy in 1950, the Tuntland Award in 1956, the Exceptional Achievement Award in 1977 (with the Gossamer Condor Team) and he gave the Barnaby Lecture in 1979. 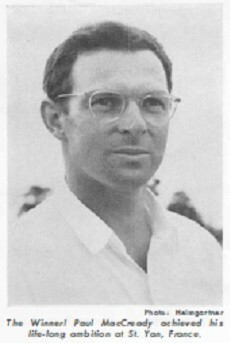 He earned the du Pont Trophy as National Champion in 1948, 1949 and 1953. He holds Silver #67 and Gold #8 both earned in 1947.